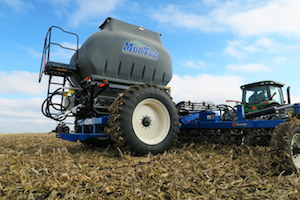 Montag’s Gen II offers a complete dual bin system with two separate 4.5-ton poly tanks, ISO scales for each tank, 1-18 rows, VRT per tank with on/off section control of up to 4 sections, complete with Montag Mfg. Rate controller. Designed to be more corrosion resistant by using stainless and composite materials with greater serviceability, easier to repair or replace parts, and easier to clean out at the end of the year. With the ability to add rows and configure drives you can now easily invest in a metering platform that can be adapted to your operation as it changes and evolves for years to come. The Schlagel Rapid-Till is designed to pull easier and faster due to its lighter weight and new style shank. 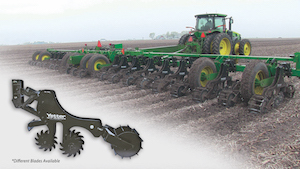 The Rapid-Till can till up to 10-inches deep and apply liquid or dry fertilizer. Rapid-Till offers operator friendly adjustments with no tools required for field adjustments. The Schlagel Rapid-Till comes in many different configurations from 4 to 24 rows and rows as narrow as 20-inches on a single tool bar with a staggered row option. 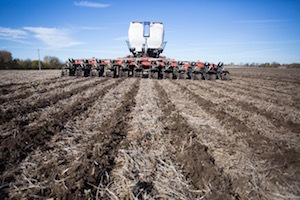 The Schlagel Rapid-Till HD offers a robust row unit that can till up to 16-inches deep with a hydraulic trip shank that auto resets and also offers dry or liquid fertilizer placement. 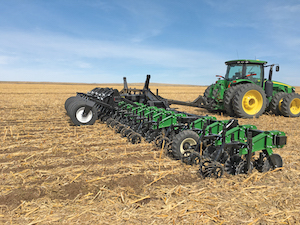 The Rapid-Till HD comes in 4 to 16 rows and rows as narrow as 22-inches. The ZoneMaster is a strip-till tool designed to create optimal spring strips or to dress up fall-applied strips. The ZoneMaster clears residue, lightly conditions the soil, speeds up warm-up and dry-down for faster and more even germination. Using “vertical tillage,” it creates an optimal planting atmosphere. ZoneMaster can also be used to apply starter fertilizer or liquid fertilizer in the root zone. ZoneMaster provides the best in quality and value to serve the purpose of creating a better yield via pre-planting preparation and soil condition optimization. The ZoneMaster is field-tested and proven. The BLU-JET® StripTracker™ combines BLU-JET's award winning stretched and staggered rows with on-board fertilizer capacities for superior residue flow and optimized fertilizer placement. The row components operate independently from one another, so each piece handles obstructions and residue independently. This allows for more accurate placement across the length of the field in rocky conditions and superior residue handling. Button stop depth control, along with pin adjust gauge wheels, more easily control depth. StripTracker utilizes easy to use features with low maintenance components providing less in-season downtime, maximizing your return on investment by lowering your total cost of ownership. Planter operators can benefit from the use of our Furrow Cruiser® spiked closing wheel, which eliminates sidewall compaction and promotes even emergence of planted seeds. Gains of 4% yield per acre were seen on average last season. 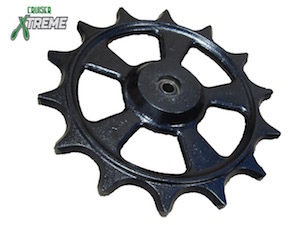 We are also excited to introduce the Cruiser Xtreme cast closing wheel. 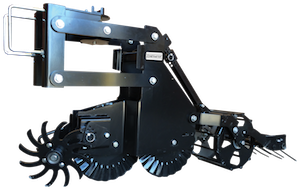 Cast closers add weight over our poly closing combination and are suitable for all tillage types, especially effective in tight soils and heavy residue planting conditions. Insure yourself against a wet/challenging spring by running the best closing wheel for your farm. Visit us online at www.copperheadag.com for videos and more information! The 1205 Kuhn Krause Gladiator models are equipped with the industry leading ST-PRO row units featuring wrench-less adjustment and zero daily maintenance. This row unit can produce one of the most prominent berms in the industry to prevent gullies forming as strips settle. Montag dry fertilizer systems are available for models over 6 rows and the 1205 pull type machine may now be fitted with a 9 ton hopper for increased output and reduced time between fill-ups. 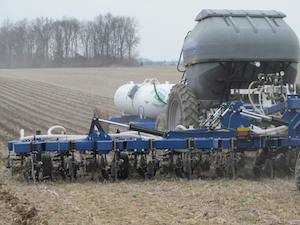 The Gen II twin tank is also available allowing two fertilizer types to be applied simultaneously, and offers variable rate and section control. Gladiators are available as 3 point mounted or pull type with 4-24 rows. Great Plains’ innovative Nutri-Pro® Precision models are designed to apply liquid fertilizer while simultaneously removing residue and vertically strip-tilling the planting zone, promoting fast, even emergence in the newly cleaned, warmed and fertile seedbed. They allow the producer to pre-apply liquid fertilizer in the spring — just prior to planting — replacing traditional methods of applying nutrients in the fall to eliminate winter nitrogen losses. Patent-pending Quik-Tach™ Coulters allow the three-coulter Nutri-Pro Precision models to be easily converted from pre-apply to sidedress so fertilizer can be applied after the plants have emerged, ensuring nutrients reach the plant directly for maximum benefit and reduced waste. Uniquely designed, innovative, special purpose coulters from Ingersoll. 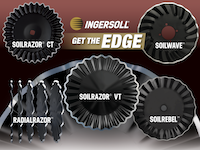 Ingersoll has developed a new family of game-changing tillage products that are not available elsewhere. These products give today’s producers a significant EDGE with their tillage, planting and seeding practices. These special purpose coulters are endowed with unique properties of material quality and design to be able to manage residue, while providing the exact amount of soil tillage desired. Plus, their patented design maintains its cutting edge throughout its working life. Major OEMs recognize these advantages and have made this new family of products the popular choice for their new equipment offerings. Strip Till for You is a farmer-owned business where we use what we sell. We have been working with Dawn Equipment and Montag Mfg since 2008 and have since expanded to include Yetter Mfg., Niffty Ag and Twin Diamond Industries for strip-till units along with Harvest International, Moore-built and B&D Metal works for pull-type and 3-point toolbars. Whether we build a turnkey machine or direct ship items from factory to your farm, we are your one stop shop for the right machine for your needs. New and used items on hand. Click here for more information or call 701-899-1439. The SoilWarrior 4500 series features toolbars from 20 to 45 feet in popular row spacings that include 20-, 22-, 30-inch and more. Multiple options allow you to customize the machine for your ground. 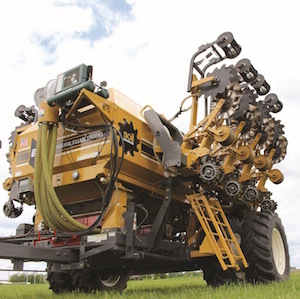 Fully precision-enabled, the SoilWarrior system allows variable rate application of up to five products at once in various combinations of dry, liquid and NH3. 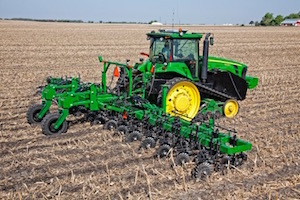 The steerable cart option allows you to take full advantage of active implement guidance and to eliminate pass to pass variances in row widths — a valuable feature when working sloped or curved ground or when planter width varies from other tools. Our patented system technology includes either the X or N row unit to till and incorporate fertilizer throughout the entire zone. Row cleaners and rolling baskets are options that help prepare a seedbed, not just a strip. Yetter’s 2984 Strip Freshener utilizes a three-blade design followed with the rolling basket to condition existing strips to warm the planting zone or create spring strips. The parallel linkage arms allow the freshener to follow field contours at operating speeds of 6-10 mph and 2-4 inches deep. The Strip Freshener includes a universal mounting bracket to fit 4-by-4-inch, 5-by-7-inch, 6-by-6-inch, and 7-by-7-inch toolbars. Optional fertilizer kit for liquid or dry application is available.